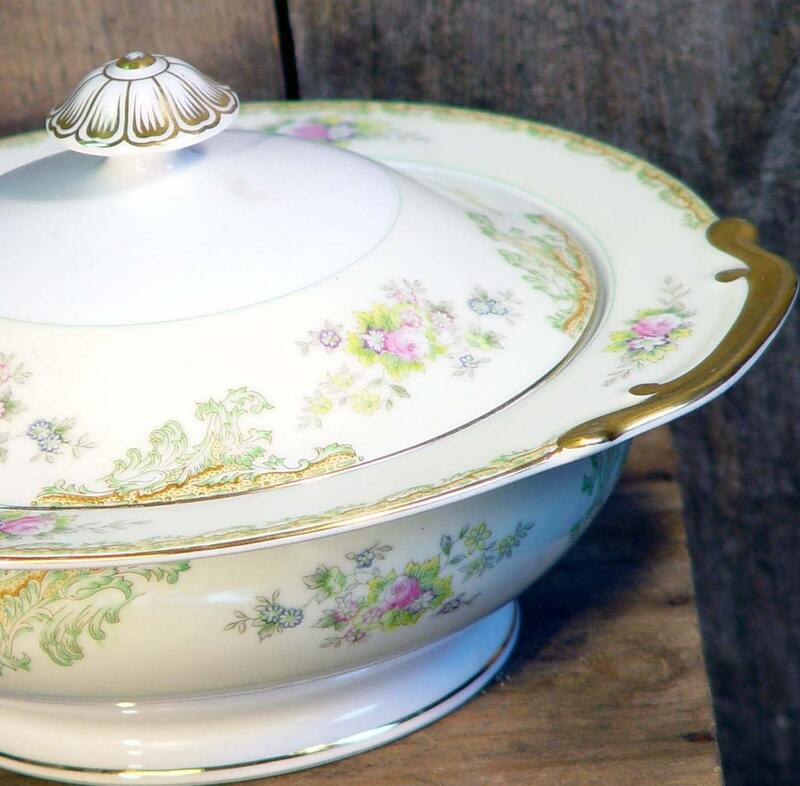 Serve your family their veggies with real style in this gorgeous vintage Meito China covered dish from Japan. This beautiful 10" gold trimmed, covered vegetable dish is decorated all around with hand painted pink rosebuds and sprays of bright greenery. This gorgeous vintage serving set is in Pristine condition. I'm thinking someone's Granny must have bought this fancy china covered serving bowl back during the Depression and kept it safe up high on the top shelf of a china cabinet on display for some special occasion that never happened. No doubt they were saving this vintage beauty just for you! Picture this stunning vintage serving set proudly placed on your family's dining room table this Easter. Pass the peas, please. Surrender Dorothy. Offering a vast and never ending array of affordable cool antique and vintage finds that you won't find elsewhere. We're one of the most diverse vintage shops around, so be sure to bookmark our shop and check back with us often so you don't miss out on anything. Beautiful! Love this unique set of earrings! We prefer PayPal as it's the fastest and safest method. Cashier's Checks and Money Orders are okay too but only if they are received within four days of your order, otherwise we'll cancel the order and put the item back up for sale. We BEG you guys, Please... If your Etsy Address and PayPal Addresses are different, please please let us know where you would like us to send your package. We have a real talent for choosing the wrong one. We are happy to accept returns in good condition in the original packaging shipped within 48 hours as exchanges only and you agree to pay postage both ways. Damages In The US Mail. Please tell us about damaged goods ASAP. Photograph the damages and send photos to us so that we can work it out with USPS. We ship by way of the United States Postal Service only. Yes, FedEx and UPS are a little bit cheaper, but we find them to be very brutal with our delicates and breakables, so we refuse to play with them. The answer is YES we do ship internationally. Please just ask! There are many shipping destinations on this planet and each one is a slightly different price. While it is considered customary for many antique and vintage shops to consider offers and dicker prices, our shop simply doesn't. We've priced our merchandise as fairly as humanly possible. Please don't ask us to haggle.